All right ladies and gents, great match-up of some aspiring Big 10 contenders. The Gophers come in 2-0 with solid wins against Northwestern and MSU. The Illini are 1-1 in the conference and are fresh off a big home win against an always-tough Ohio State squad. Playing in Assembly Hall is always a tough test. The place was rocking tonight for this Top 10 clash. 20:00: Here we go!! The Gophers have great energy out the gates, but seem to have a difficult time harnessing that energy. Energy without that focus just leads to chaos, especially on the offensive end. Tubby needs his guards, Hollins Squared, to settle the team down. 16:31: Well, its official, our JV Big 10 Network announcers are thoroughly confused. They thought Brandon Paul just posterized Trevor Mbakwe. Instead, it was the savvy senior who drew the offensive foul. Tubby has this Gophers teams rotating on the defensive end really well. Quick aside, how come we did not get Gus and Len for this game?!?! Match-up of Top 10 squads and we get these two hunyucks. 14:38: Gophers show that flash in transition that makes them so tough to beat. Coleman goes hard to the rim and finishes with a strong dunk. That transition, up tempo style is what makes the Gophers so dangerous. Forcing that style on the Illini definitely favors the Gophers in this game. 12:10: Gophers cannot get into a 3 point shooting contest with the Illini. Poor rotation in transition and D.J. Richardson, that is right, D.J. Richardson, puts the Illini up 3. Gophers need to force the Illini to beat them in the paint, where they are weaker than Mark Wahlburg doing the traffic/weather. 9:52: Evidently D.J. Richardson did not crack Tubby’s scouting report because the Gophers cannot find him on defense. He is just daggering the Gophs from deep. With two buckets in less than three minutes, you can be sure Tubby will mark him on defense for the rest of the game. 8:01: Instant energy from Oto Osenieks????? Whhhhhhhhaaaaaaaaaaaaat?????? You got it! Young fella has played much better in the last few games and he triggers a little mini-run for the Gophs. My only knock on Oto is that he is supposed to be a shooting specialist and yet, it seems like we never see him let it fly. Not sure if it is a confidence issue or just not getting the opportunities. Mbakwe’s fingerprints were all over this game. He dominated on the offensive end, wiggling/powering his way to open shots all night. 6:49: Trevor Mbakwe reintroduces himself to fellow senior Brandon Paul with a less than soft foul. Could it be that Trevor was thinking about the near posterization that occurred a few minutes ago when he was decided to lay the wood to Mr. Paul on that drive? Nah. Young fella, meet a man. Man, go easy on the young fella. 4:45: The transition game is eating up this Illini team. Solid passing and cutting leads to 4 big baskets and is punctuated by a thunderous Williams dunk. Gophers stretch their lead to the biggest of the game at 6. Need to keep forcing the Illini to play this way because that definitely favors the Gophs. 2:08: Gophers continue to miss golden opportunities to extend their lead. Instead, the whistle-happy zebras bail out Brandon Paul, gift him 2 free throws, and now the Gophers are only up 4. Just when things are starting to unravel, Austin Hollins drains his second 3 PT of the game. His shooting touch right now is just absurd. The heck with the transition game, let’s get him the ball until he shows us he can miss. Half: Gophers lead it 34 to 30. Played a strong 1st half. The Gophers dictated tempo and rotated well enough on defense to prevent the Illini from getting those 3 PT attempts they love so dearly. Mbakwe and Coleman have been particularly strong and hopefully they can continue to dominate in the paint and in transition in the 2nd half. 17:29: Joe Coleman wastes no time. He has been absolutely terrific in transition tonight. 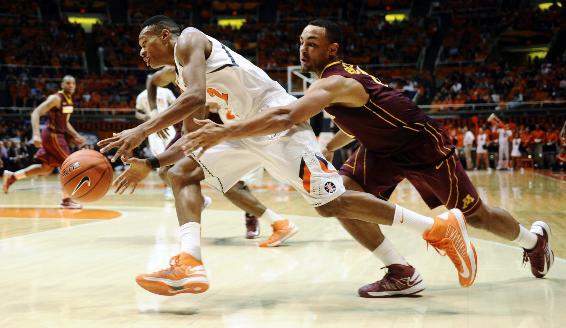 He has consistently beat his defender down the floor and disrupted the Illini defense as a result. Another two FTs for the visiting squad, Gophs up 9. 16:17: Alright, so it must be something in the Hollins family tree. Dre just cans a 35 footer as the shot clock expired. Are there any other Hollins brothers or cousins that we could get in a jersey? At this point, I am fairly certain any player in maroon and gold with Hollins on their jersey is going to have in-the-gym range. 14:33: Pause. Your not-s0-friendly Big 10 match-up has been interrupted by the officials. Evidently the zebras have decided that they are the reason that everyone is at the zoo. Need to stow the whistles and let the kids play. Instead, they call an incredibly silly double foul against Mbakwe and the Illini’s Egwu for doing some twisted version of a waltz. No, this is not a photo of one of the referees from the game. 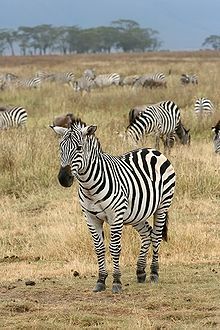 This is an actual zebra. 13:41: J.J. Abrahm’s cousin is single-handedly trying to get the Illini back into this game. He has woken the crowd up by attacking and finishing at the rim. Combine that with the suddenly stagnant Gophers offense and the lead has been whittled down to 4. 11:35: The unrelated Hollinses have not done anything in a while. So, Dre picks up an intentional foul on a solid steal and Austin cans his 3rd PT of the game. Gophers stretch the lead back to 9. 9:12: J.J. Abrahms cousin just picked up his 4th foul. That is huge. The Illini comeback has been almost entirely driven by his aggressive play. Coleman cans the FTs and puts the Gophs up by 7. The Illini look lost on the offensive end and settle for a 26 footer. Without Abrahms out there to dictate the pace and run the sets, this is an entirely different squad. 7:09: Coleman continues to dominate in transition. Another easy lay-up for the stellar sophomore. He now has 18 for the game. He is a smooth finisher and has solid body control after he leaves the ground. If he continues to improve, he is going to be conference player of the year materials sooner than later. Mbakwe has disappeared a bit. Now would be the perfect time for him to reassert himself. 6:15: Mbakwe heeds the call, snapping up an offensive rebound and finishing for the old fashioned three point play. Even though Mbakwe is rarely the tallest player in the paint, he uses his body to position himself so well. Just instinctual. On this play, he grabs the rebound with his right hand and finishes his shot quickly with his left. He now has 19 in the game. Coleman has been a thorn in the Illini’s side all evening. Causing them headaches on both ends of the floor. 4:43: Coleman nails another 3!!! That gives him 23 points on the night. He is having a coming out party in Champagne tonight. Even though he is not normally looked to for his shooting, he has made both of the wide open attempts he has taken tonight. It is also important to note that Coleman’s shot was set up by a great ball-reverse drive by Dre Hollins off the pick and roll. This is a move that he has perfected, where Dre will take one step like the ball handler normally would on a pick and roll and, when he sees the defender going underneath, he then cuts back to where he came from, essentially following the guy who was supposed to fight underneath the screen and using himself to screen both players, opening up a shot for a teammate on the elbow. 2:52: D.J. Richardson remembers that he is D.J. Richardson. It could not come at a worse time. He air balls a 3 PT attempt as the Gophers continue to rotate well on the defensive end. More than anything, the Gophers improvement in perimeter defense is what makes this season so promising. Under the Tubby regime, that perimeter defense has been a persistent flaw. Instead, the Illini are 3 for 23 from deep tonight. This is one of the best 3 PT shooting teams in the country and they are getting their faces rubbed in it. 0:51: Coleman dunks home his 28th and 29th points. What an amazing night for the stellar sophomore. He continually beat his defender down the floor and finished consistently. Overall, probably his best performance in a Gophers uniform. 0:00: Strong win for the Gophers. They come out and drop 50 on the Illini in the 2nd half. Aside from the solid burst from Oto, the bench was pretty quiet tonight. But, the whole team played absolutely smothering defense and, except for one little mini-run, the Gophers were in control of the game throughout. Next up: Indiana. They match-up better with the Gophers than the Illini did. But, if the Gophs can dictate the athletic tempo they like to play at, the Hoosiers are going to have their hands full. This entry was posted in Badgers v. Gophers, Home and tagged Andre Hollins, Assembly Hall, Assembly Hall Gophers, Austin Hollins, Big 10 Network, Brandon Paul, Coleman Gophers, D.J. Richardson, Fighting Illini, Gophers, Gophs, Hollins Squared, Illini, Illinois, Joe Coleman, Mbakwe Gophers, Minnesota Gophers, Ohio State, Oto Osenieks, Trevor Mbakwe, Tubby, Tubby Smith. Bookmark the permalink.